mt and temple2, originally uploaded by c_p_lew. 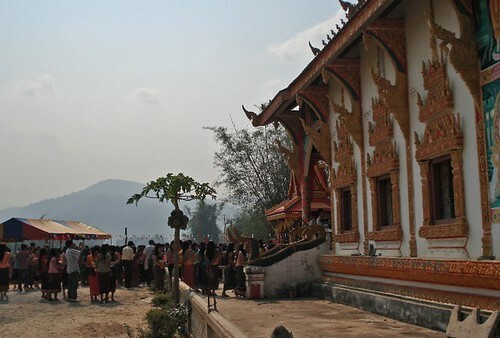 People go to the temple to make merit during the Lao New Year holidays. There were maybe about 500 people at this temple. After offering food to the monks, everyone goes around to visit elders to wish them good health and long life in the new year. 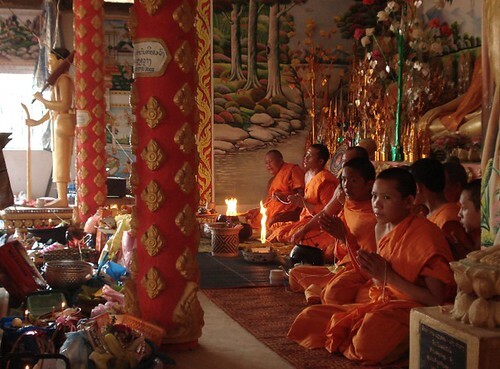 They also visit other temples to make offerings as well as to pour water on the Buddha images to clean them. People also clean the graves or stupa of relatives - washing off the cobwebs and painting the stupa. This is considered to be the last day of the old year. Tomorrow is the New Year Day. Ban Yone temple, originally uploaded by c_p_lew. Inside the temple. The monks are chanting Buddhist prayers while people outside the temple are offering food. Pretty pictures! I find the date for Lao New Year interesting. April 14 is the first day of the summer half of the year in Scandinavia, a date that traditionally had to do with flipping to the summer side of the flat, traditional Scandinavian calendar stick, the primstav, which showed important dates for a half year per side. Great photos -- the second one is so rich and colorful - it tells an entire story without saying a word. Beautiful! @keera_ann_fox - Originally, the new years for Lao, Thailand and Cambodia were based on the new moon in the fourth lunar moon but I believe it got changed to midway through April to allow a respite from working during the hottest time of the year. @t.r. - the paintings on the wall of the temple are of different stories of the life of the Buddha, to pass on the traditions to young people. These are gorgeous photos. What a beautiful place. Have a blessed new year! This is really interesting, I knew of the Chinese New Year, but not this one!